We have been established since 2003 and have made good progress in developing a working relationship with the club and raising the profile of financial and ownership issues. Membership has continued to grow and we now have over a thousand members, many of whom are individual shareholders in Arsenal. Approximately 4.5% of the club's equity is owned by small shareholders like us. In 2010 the AST established Arsenal Fanshare, a scheme designed to allow more supporters a chance to own part of a share in Arsenal. 2000 supporters invested £2m to become members and buy 125 shares, making Arsenal Fanshare the third biggest shareholder in the club. Despite its amazing success, AST took the decision to close the scheme in 2015 because of a lack of liquidity in the share market - with Stan Kroenke and Alisher Usmanov engaged in a land grab for ownership, there was simply no availability of shares to buy. As the scheme relied on share purchases to pay for operational costs, this ultimately resulted in a shortfall in funding and the scheme was closed. On this website you will see the range of activities we are involved in, including meeting with the major shareholders in Arsenal Football club, gaining press coverage of our activities, scrutinising Arsenal's financial progress, attending club events and raising the profile of the club through marketing activities. Every member of the Arsenal Supporters' Trust shares in ownership of Arsenal Football Club. The Arsenal Supporters' Trust is registered as an Industrial and Provident Society. This means we are a mutual company, owned equally by all of our members. Each member has one vote in the Trust's elections and decisions we make about how to use our shareholding. 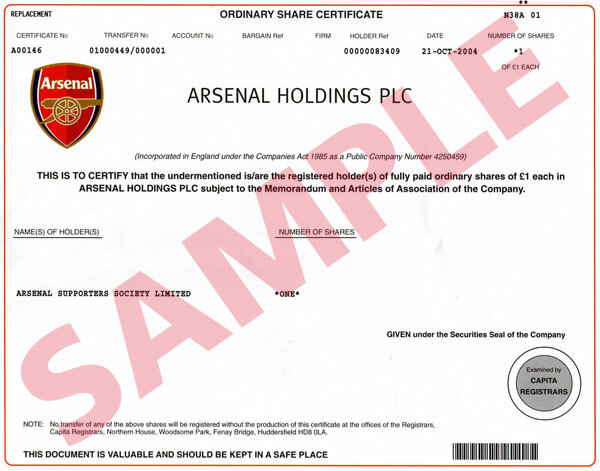 In 2004 we purchased our first share in the club (for a copy of our share certificate click here) and at the 2006 Arsenal Holdings plc AGM it was confirmed the club would be giving the trust the so-called 'Orphan Share'. The Trust also bought a further share in September 2006 taking the number of shares we own to three. To view the formal constitution of the Arsenal Supporters' Trust, please click here. Please do have a look at our site, read what we've done so far and sign up to membership (a whole year's membership costs less than the price of one match ticket). Even better, come along to one of our meetings and get involved. We look forward to hearing from you. The Arsenal Supporters' Trust is run by its members. Every member is eligible to stand for election and to vote for candidates for the AST board which is accountable to you and your fellow AST members. The trust produces independently audited annual accounts, and provides regular updates to members through meetings, newsletters, emails and the website.